Mission Statement: "Called by our Baptism, we the followers of Christ at St. Andrew's Parish, invite all to share their time, talent and treasure, as we seek justice and charity for those in need." Ministry participants make weekly visits to male and female residents at several nearby nursing homes, on individualized schedules, each week throughout the year. Wherever possible, volunteers are matched with residents based on interests and personalities. 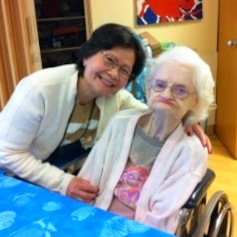 These thousands of face-to-face visits bring much-needed friendship and support to residents, who eagerly await their St. Andrews friends. Ministry Leader Chris Parry may be contacted at 856-906-5127 or spcp1@comcast.net Ministry volunteers collect and sort donated clothing, shoes and accessories for distribution to the needy and struggling in our parish and the surrounding community, as well as to Joseph's House and New Visions Homeless Day Shelter in Camden. Friday, Sept. 14: Food Distribution at Parish Hall, 9:30 AM; Friday, Oct. 12: Food Distribution at Parish Hall, 9:30 AM; Nov. 3 & 4 (Sat. and Sun.) Food Collection Bags Distributed after all masses; Nov. 10 & 11 (Sat. and Sun.) Food Collection and Sorting; Nov. 14 (Wed.) Produce delivery and pack Thanksgiving Food Baskets; Nov. 16 (Fri.) Distribute Thanksgiving Baskets; Dec. 7 (Fri.) Voorhees Middle School Food Drive pick up, sort, and set up tables for Christmas Food Distribution; Dec. 12 (Wed.) Produce Delivery and Pack Christmas Food Baskets; Dec. 12/Dec. 14 Distribute Christmas Food Baskets. Remember needy families, children, seniors, veterans, and the homeless this Christmas. Select one or more ornaments from our Giving Trees located at Church and at the Parish Center. Return items or gift cards below the trees no later than December 16.